To The Batpoles! Batman 1966: #015 Purrrrrfect! At last, it's time to talk Catwoman! Lovely Julie Newmar's first appearance on the show finally gives us a strong female character -- but what exactly do we mean by "strong female"? Also, how lines that strike adults as "what a square Batman is" jokes also worked to impart serious messages to kids, Nelson Riddle's beautiful musical narration, another raunchy joke that got past the censors, and more. 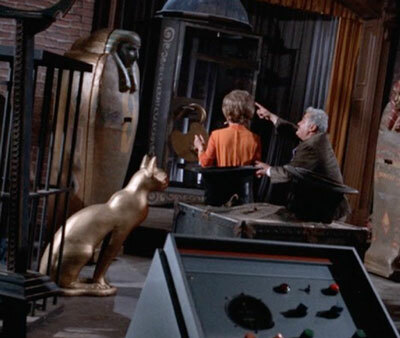 About that cat in Zelda's workshop: Way too big to be one of the statues Catwoman stole! Catwoman and Molly are making me hard boiled!